Daughter #2 loves mushrooms. She also likes a bit of variation in her school lunches, so I have introduced this recipe to her repertoire. 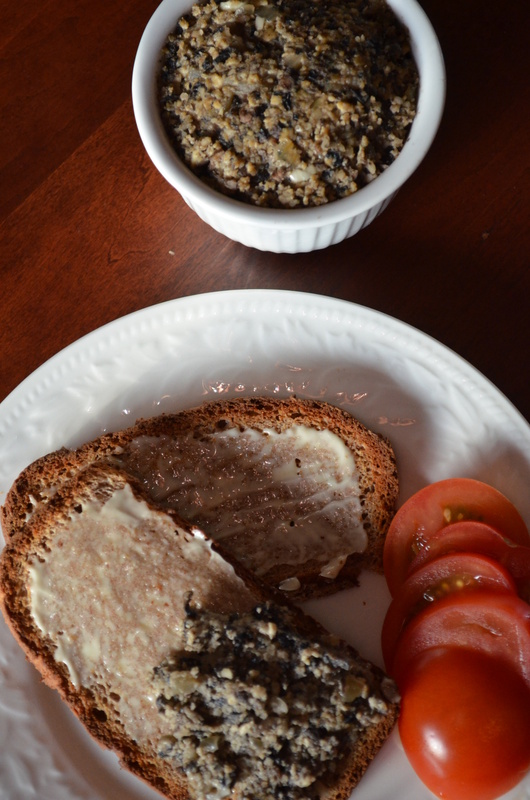 Mushroom pate is pretty quick to make, and squishes down nicely in sandwiches. It’s a lightly peppery, distinctly mushroom-y affair, good enough to serve to guests, but not to those who don’t like mushrooms. Vegetarian, mushroom pate, here served on teff toast. Sauté the onion in the margarine for a couple of minutes, then add the mushrooms and thyme, and sprinkle with the 1/4 tsp salt to draw out their water. Once the onions are cooked, and the mushrooms are softened, add the garlic to warm through. Put all ingredients into a food processor, and pulse until a rough paste has been attained. Return the pate to the pan, and cook over a gentle heat for 5 minutes to drive off excess moisture, stirring frequently. Check for seasoning, press into serving bowls, and refrigerate until ready to eat. Posted in B.2 Dips, Spreads, Pates, and other blended things. This pasta sauce is rich with a very pronounced taste of tomatoes. It’s one of those instantly ready ones that can be made in advance, but is still good enough for entertaining, along with a light, green salad of some description. Blend everything together with 6 fl oz (3/4 cup) water until completely smooth. Stir into cooked pasta. This amount is sufficient for 1 lb of dry GF pasta.